Thyme is a wonderful and versatile herb; there are almost endless ways to use its delicious and fragrant leaves in everything from salad dressings to marinades to sauces. Like most herbs, thyme can successfully and relatively easy to be grown indoors; it needs only a bright windowsill and some basic attention to thrive. You can propagate thyme fairly easily, but there's no need to do so. With pots of young thyme readily available (even in grocery stores), it's a simple matter to keep a thyme plant alive while you slowly consume it, and then replace it when the plant begins to look weak. While thyme is easy to grow, it does better when kept well watered in a warm, bright location. Light: Thyme prefers bright light or full sun. I have excellent success on an east-facing windowsill. It can also be grown fairly easily under standard or compact fluorescent lights for a year-round supply. Water: Water regularly, but not excessively. Let the soil dry slightly between waterings. Thyme is naturally drought resistant. Temperature: Average. Thyme is a hardy plant that will thrive down to 50˚F and up to 80˚F or higher. Soil: Airy, light, fast-draining soil. Fertilizer: Use liquid fertilizer, or supplement the soil with controlled-release pellets. For organic thyme, use organic fertilizer or fortify soil with compost. Thyme can be easily propagated from leaf-tip cuttings or division of mature plants. To divide a large plant, remove the plant from the pot and gently tease apart the root ball and stems, then plant each ball in its own pot. In most cases, however, it's usually easier to discard older, woody plants and buy new thyme plants. Thyme can also be readily grown from seed, which opens up a larger selection, such as lemon or Spanish thyme. Thyme seeds germinate in one to three weeks. Most thyme plants are only repotted after their initial purchase, perhaps stepping up from the 4" nursery pot into a 6" pot, which is plenty large enough to support a thriving and healthy thyme plant. Older plants develop a woody stem. You can divide older plants at repotting time and place them back into 6" pots with fresh soil—there is no reason to grow thyme in larger pots for kitchen use, especially if the thyme is part of a collection of kitchen herbs. As one of the world's oldest aromatherapy and medicinal plants (it's been in cultivation since the time of the ancient Greeks), there are many varieties of thyme. The most popular is common thyme or Thymus vulgaris. This plant is sometimes also called French thyme (although not exclusively). Other popular varieties include the citrus thymes, which are cultivars with a distinct citrusy aroma and flavor. Lemon thyme, in particular, is a wonderful herb. 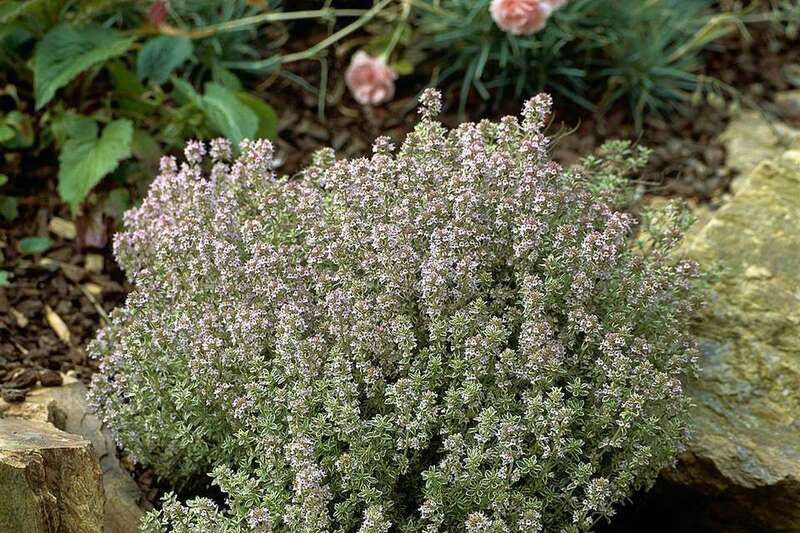 Other varieties include orange thyme and variegated thyme. Some forms of thyme are used as ground covers and are important sources of nectar for honeybees, but are not edible themselves. Thyme is not a difficult plant to grow. In outdoor gardens, it's frequently used in xeriscaping in hot, dry locations where other plants have trouble thriving. It's hardy in USDA zones 4 to 9, although it can be grown in Zone 10 in the winter months. It can even tolerate light frosts in higher elevations. Indoors, the biggest challenge you'll probably face is providing consistently bright light and avoiding pests. Obviously, because it's a herb that you'll want to eat, you'll want to avoid as many pesticides and chemicals as possible. Thyme is prone to whiteflies and mealybugs. Use neem oil where necessary, being careful to follow label instructions.